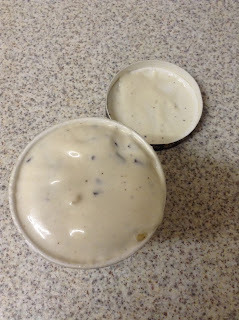 When I heard Ben & Jerry's were launching their Non Dairy ice creams in the UK I was super excited indeed. There's a lack of variety in the Dairy Free market and so it's nice to see a big brand like Ben & Jerry's coming out with some quality flavours. They now do Peanut Butter Cookies, Chocolate Fudge Brownies and Chunky Monkey, all available from Tesco and Ocado.com. 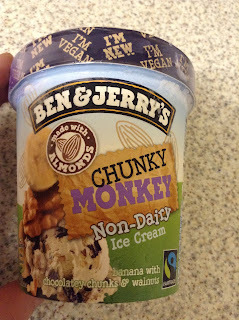 I couldn't try the first two since they contain gluten, but this Chunky Monkey variety doesn't - hurrah! 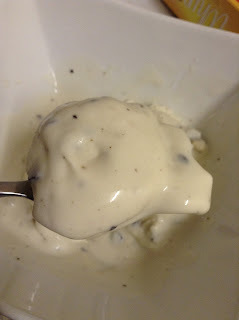 Described as "banana flavour dairy free ice cream with chocolatey chunks and walnuts", this is made with almond paste and coconut oil, and costs a whopping £5.50 in Tesco. Not cheap! 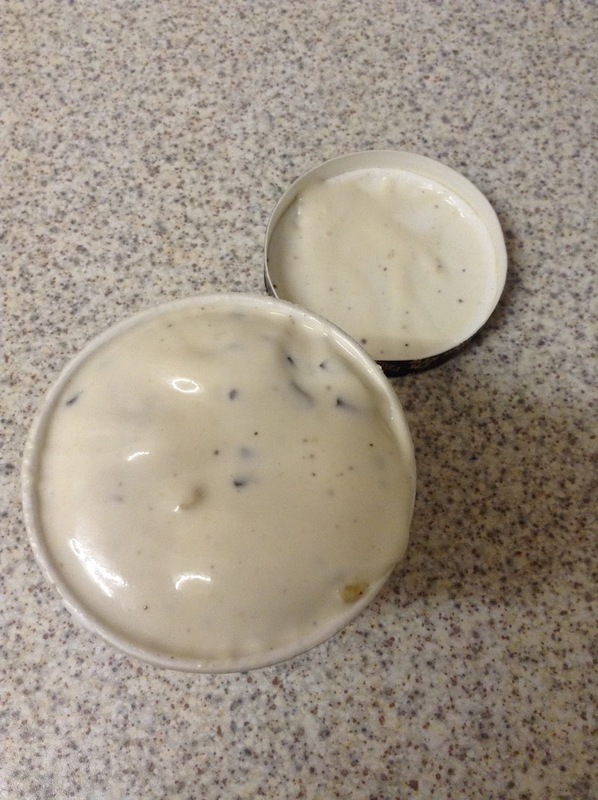 By the time I had got it home the ice cream was very runny, moreso than a regular half defrosted tub of Ben & Jerry's. This didn't bother me though since I don't like ice cream that's rock solid! Taking a spoonful, it was instantly melt in the mouth and had a strong banana flavour. 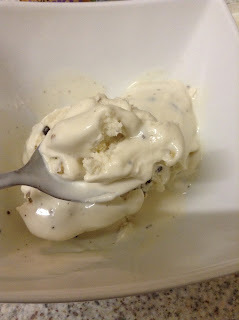 It wasn't at all artificial and tasted very fresh, and the lack of dairy seemed to make it taste even more refreshing than regular Ben & Jerry's ice cream. The choclolatey chunks and walnuts give it a nice texture; the chunks aren't true dark chocolate but they still replicate the flavour well enough, whilst the walnuts give a nice savoury nuttiness that goes well with the banana flavour. This is a nice ice cream, and definitely a lot tastier than the likes of of the Alpro Dairy Free Ice Creams launched last year, but is still a bit thin in texture and doesn't feel quite as luxurious as it could have. 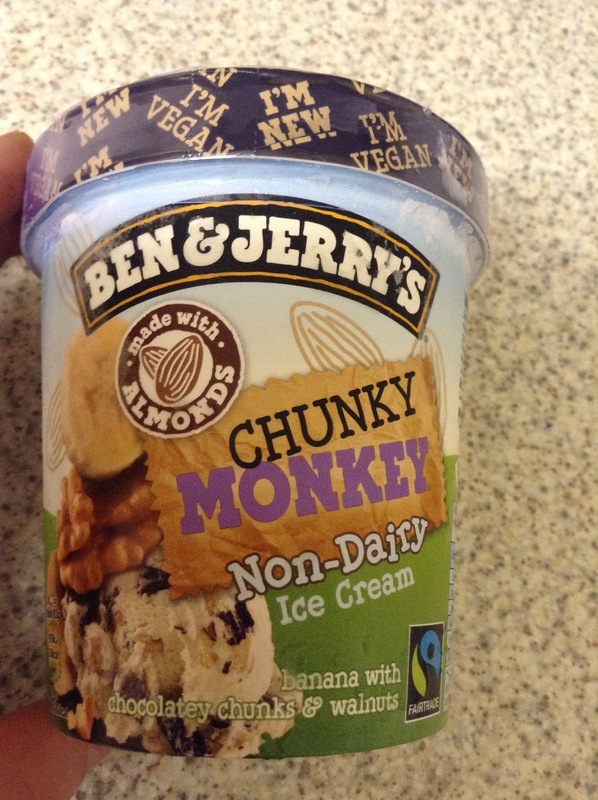 Still, it's great to see Ben and Jerry's bringing more variety to the Dairy Free/Vegan market. A shame they didn't do more varieties for those of us who are gluten free but let's hope they bring out more in future. The Non Dairy Cherry Garcia ones in the US sound great! Ingredients: Water, sugar, coconut oil, walnuts, banana puree (5%), glucose syrup, almond paste (2%), fat reduced cocoa powder, pea protein, emuslifiers sunflower lecithin & soy lecithin, lemon juice concentrate, stabilisers guar gum & locust bean gum, vanilla extract, banana flavouring, natural flavouring. Nutrition Information per 100ml: 218 Calories, 12g Fat, 25g Carbohydrates, 23g Sugars, 2g Protein. Have you tried the new Non Dairy Ben and Jerry's Ice Creams? Let me know your thoughts in the comments! The vegan PB and Cookies one is so much better. it has actual chunks of peanut butter in it. It is now my go-to tub even though I'm not vegan!